The Seahawks will count on former first-round pick Marcus Smith to help fill the void created by the indefinite absence of Cliff Avril at rush end. For as long as he takes on a larger role in the Seahawks’ defense, Marcus Smith says he has one clearly defined goal. “I definitely don’t want to let Cliff (Avril) down or Mike (Bennett) down,’’ said Smith, who will become a regular in the defensive-end rotation while Avril is sidelined because of a neck/spine issue that has his football future uncertain. 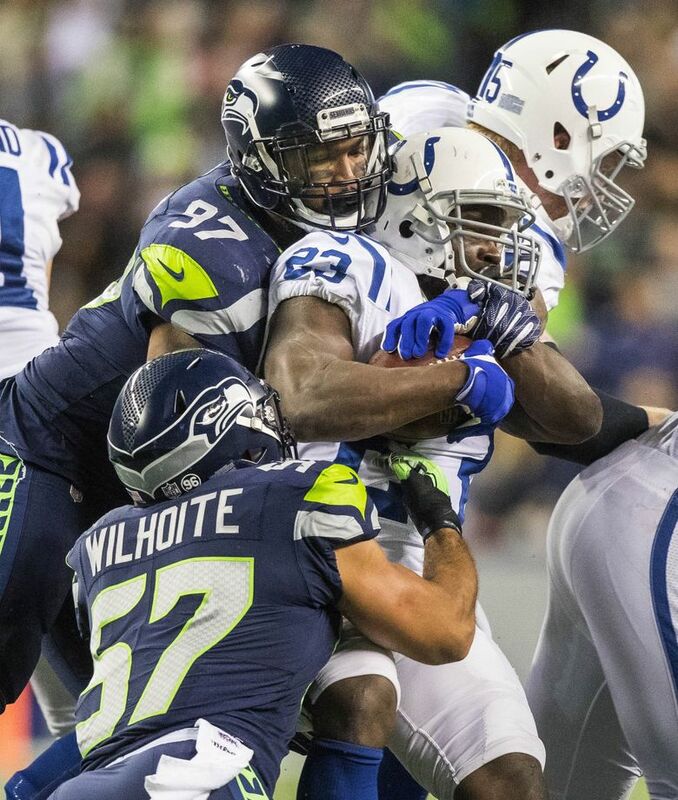 Smith showed Sunday in the Seahawks’ 46-18 victory over the Colts that he might fill that role well. He had 1.5 sacks and forced a fumble that Bobby Wagner returned for a touchdown in the third quarter. “I just want to go out there and be able to capitalize on what I did last week,’’ Smith said this week after the team declared Avril out indefinitely. Smith will back up Frank Clark at Avril’s position and will play in pass-rush situations. The Philadelphia Eagles released Smith in July, three years after selecting him with 20th overall pick in the 2014 NFL draft. The release made him one of the bigger draft busts in the team’s history. Does he want to show the Eagles they erred in releasing him? In fact, Smith sort of helped pave his way out of Philly, where he struggled to show why he was a first-round pick. At Louisville he had 14.5 sacks as a senior in 2013, second in the nation. But in three years with the Eagles he didn’t start any of the 37 games in which he played and had just 24 tackles and four sacks. After the Eagles declined to pick up the fifth-year option on his contract in May — a sign he read accurately as indicating that the team no longer considered him in their long-term plans and maybe not even for 2017 — Smith decided not to attend voluntary Organized Team Activities. The Eagles released him in late July, before they would have owed him a $594,000 roster bonus. Within hours of being released Smith said he had offers from the Seahawks, Green Bay, Kansas City and Indianapolis. The Seahawks, though, seemed an obvious fit for Smith. They had been interested in him coming out of college. Their decision to trade out of the draft’s first round that year came after he was selected, and as coach Pete Carroll often says, a team can never have enough pass rushers. And they also have his college position coach, Clint Hurtt, as their defensive-line coach. Hurtt said he didn’t have to convince the Seahawks to sign Smith. And if some questioned that after what happened with the Eagles, Hurtt said they shouldn’t have. Hurtt recalled how willingly Smith had been to give up his dream of being a quarterback at Louisville and move to defense. Smith threw for more than 1,800 yards as a senior at Hardaway (Ga.) High School, where he also was a standout basketball player. At the time, the 6-foot-3 Smith weighed about 220 pounds and was recruited by Louisville as an athlete, making it clear he wanted to play quarterback. Smith said changing course was almost more of a mental challenge, though he also had to bulk up. Smith had to re-adjust his mind-set again with Seattle. He had two head coaches with the Eagles and even more position coaches, as he was used as a defensive end and inside and outside linebacker. The Seahawks like his versatility, but so far they have used him almost exclusively as a rush end. A couple of good games, of course, is hardly enough to declare that Smith’s second act in Seattle is an unqualified success. That would come with production over time. But Smith said he’s felt comfortable in Seattle from the first day, having heard stories of other players who turned things around with the Seahawks. “I know I didn’t have a great start to my career, but I knew that coming here I could eventually revamp it and get back to where I want to be,’’ Smith said. And Hurtt said he sees the player he knew at Louisville quickly returning. It’s a revival coming just in time for the Seahawks.